This is seriously my new obsession! Well, I’m hoping some of you get bit by the soapmaking bug too and try your hand at this recipe I came up with. It only requires four ingredients- canola oil, oilve oil, distilled water and sodium hydroxide (lye). I kept it nice and basic and didn’t add any fragrances or colorants. I just wanted to show you other beginners how the process works and show you what the finished product looks like. 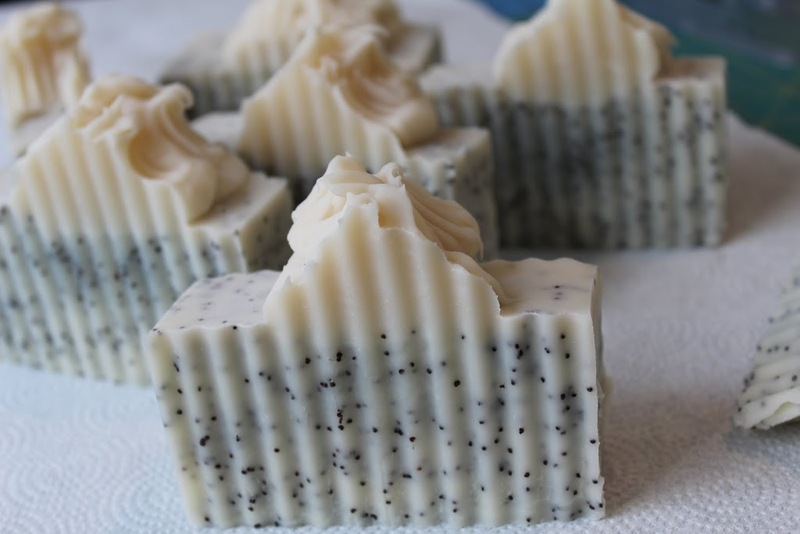 …and here is my latest soap batch. I call it Baby Puff. 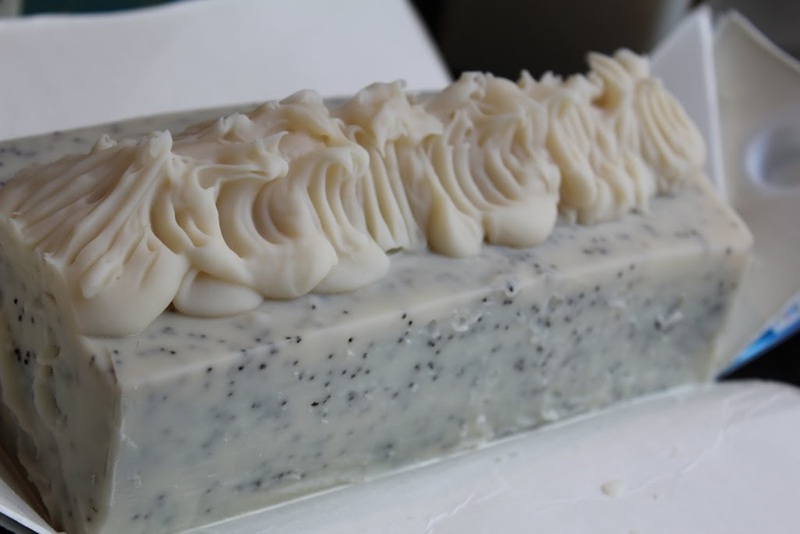 It is scented with a baby powder fragrance oil and has poppy seeds for exfoliation. I created a mold out of a recycled milk carton. I can hardly wait to see if it turned out okay once I cut into it! They are just perfect! I love these random soap experiments. Let me know if you make your own soap or gave my recipe a try! I’d love to know how it turned out! If you are interested in purchasing some handmade soaps check out my friend’s shop. She makes some amazing works of art! She just started a blog too and you can find that here. Just contact her here to place an order. New hobby & new sponsor! It is a good idea to keep some vinegar on hand when you make soap, so that if the lye splatters or gets on you, the acid can counteract they lye. Of course, flush with water afterwards. It is also good to use glass bowls so plastic won’t interact with the lye or soap. I like the crinkle cutters. Would be handy to have. 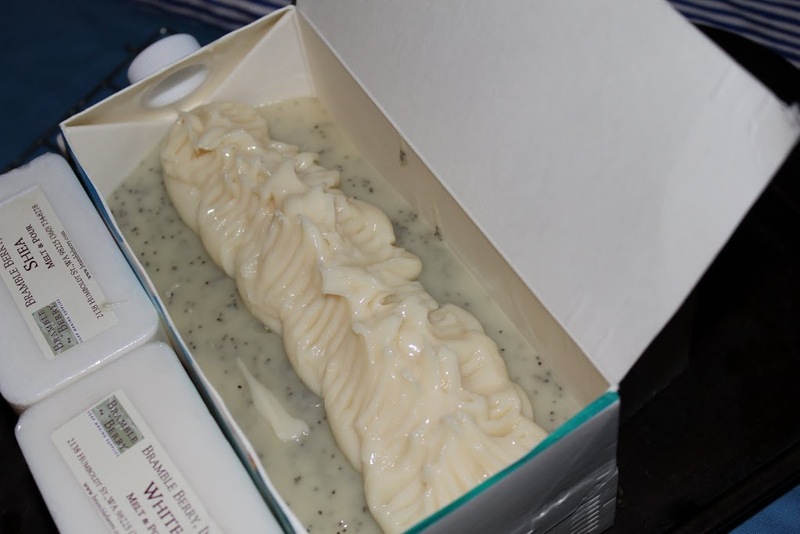 I’ve noticed that you’ve been posting a lot of soap pictures on Facebook recently. Are you planning on doing a more in depth tutorial with the process and measurements? If not that’s cool I just prefer watching your tutorials to most other peoples LOL. Love your video tutorial! You make it look so easy! I was wondering how your soap turned out? – long and stable lather? Great & easy canola and olive oil recipe. It was my first batch and it made a good hard bar – rinses clean and lasts a long time; there aren’t too many bubbles. I’d like to make a larger batch and was wondering if you have already made one. If so, how did it turn out? Were the results also as great? Also, the Baby Puff looks fantastic! You are so awesome and sweet! Hi Venessa, where do you keep the lye solution? It is combustible. I have been planning to make soap at home for a long time, but I don’t know where and how to keep the lye solution at home. Please suggest. I don’t store the lye solution anywhere. I only use the lye that I need for each individual recipe. When the lye is in the container it comes in when you buy it is fine sitting somewhere at room temperature. It only starts to heat up when it is added to the water. Hope that helps. WOW! You made it look so easy! Thank you for the great tutorial :). I make my own soap. Cold Compress. I love it! I was planning to try this out but I dont know if I could use olivextra premium oil its has olive oil ,grapeseed oil and conola oil. Hi Vanessa. You do a great job making crafts and I luv them all. I just want to ask you if u made a homemade shampoo and conditioner recipe. If u have ever made it, can u please give me the recipe. U also have cute and beautiful children. God bless them and u. Thanks for sharing. how we clean the utensils used after to do the soap?